Size: 90 count in great tasting pudding. No capsules to swallow. 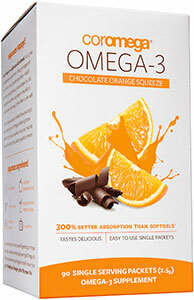 Coromega - An excellent alternative to capsules.... with no fishy taste or fish burps. Comes in a tasty individual serving size of a stevia-sweetened pudding. 300% more absorbable than softgels. Excellent for ADD and ADHD for adults and children! Highly beneficial for psoriasis, exzema and dry skin! 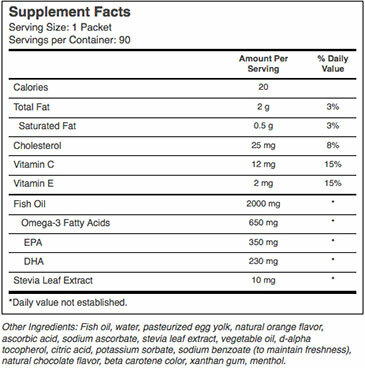 Coromega fish oil is proven to be 5X's more pure than the industry standard. ** Coromega is committed to providing safe and pure products for you and your family. The oil used in Coromega comes from small, deep, cold-water fish that are less likely to be contaminated. The oil then undergoes molecular distillation, which removes toxins, heavy metals and PCBs. Coromega is manufactured in our state-of-the-art GMP compliant facility. Sophisticated testing methods assure that the purified fish oil used in the manufacture of Coromega is of the correct composition of fatty acids. Coromega is tested by third party laboratories and certified by NSF and consumerlab.com.